When brain cells are wired in a manner that strays from their normal connectivity, functional consequences arise. Abnormal neuronal morphology and connectivity has implications in a wide variety of brain diseases and disorders from neurodevelopmental disorders to cognitive ageing. Collectively known as the connectome, researchers have been mapping neuronal connections in the brain for almost 150 years. Since the days of Neuroanatomist Santiago Ramón y Cajal, neuroscientists have been drawing and mapping the structure of neurons and other brain cells in an attempt to elucidate their function and understand how the brain works. Little did Cajal know back in 1906, that his methods of archiving neurons would change very little into the 21st century. Despite advances in techniques to label neurons, and although new computational methods to draw their morphology have replaced the Golgi stain and the paper and ink Cajal used, not much else has changed. 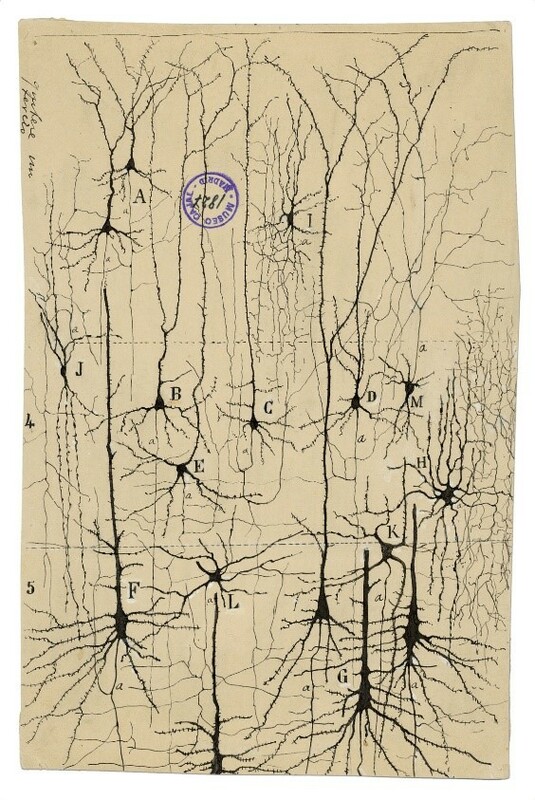 His work is still very much relevant today and neuroscientists still draw each neuron manually, albeit digitally. 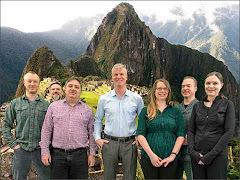 Interestingly in this age of bioinformatics, the field is still struggling to find a way to archive and connect the input/output trees of all of the neurons researchers have drawn by hand in software packages such as Neurolucida or ImageJ/Fiji. 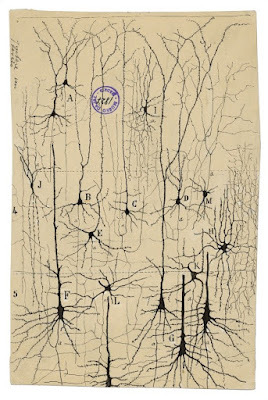 Santiago Ramón y Cajal, Golgi stained pyramidal cells of the cerebral cortex (detail) ink and pencil on paper. Courtesy of the Cajal Institute, Spanish National Research Council, or CSIC. Madrid. Spain. 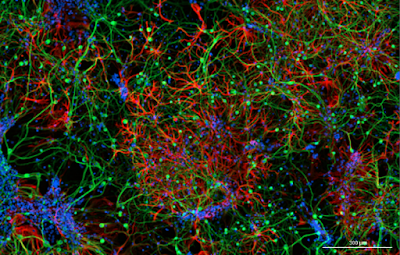 The process of labeling neuronal nuclei is straightforward, inexpensive and accomplished in a variety of ways. 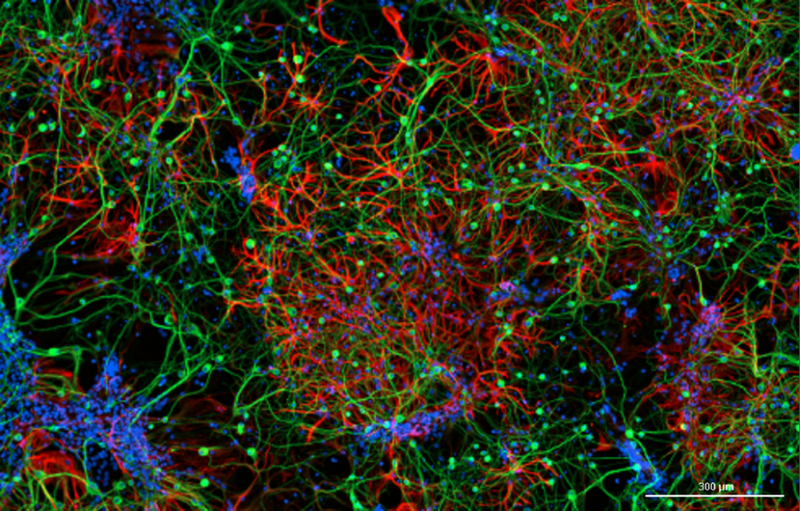 Neuronal nuclei in a brain tissue section or in a 2D neuronal culture are visualized using fluorescence markers or colorimetric detection such as DAB and Nissl staining. With the exception of slight size differences, all neuronal nuclei are relatively similar in morphology. Only when you begin labeling the processes of these cells, do their differences in structure begin to unfold. Furthermore, because of the sheer number of connections in what appears to be a tangled web of dendrite and axonal networks, untangling these connections to make sense of this wiring diagram introduces an enormous amount of difficulty and complexity. From images like these (Fig. 2) however, researchers can screen their targets in a high throughput manner using different HTS imaging platforms, without the need for laborious, manual tracing. Assays like these provide readouts for metrics like global neurite outgrowth, synaptogenesis, differentiation and phenotypic analysis such as the one presented at Neuroscience 2018 by C. Pandanaboina et al. MAP2 (red) and GFAP (green) respectively and nuclei counterstained with Hoechst. However, there will always be a need to dissect brain circuitry to parse out different aspects of development and disease. Likewise, in order to accomplish this, open access to findings will be key in understanding complex brain networks. Researchers in a wide variety of neuroscience disciplines are finally coming together in a concerted effort to build a central resource to assess these complexities using computer models and machine learning algorithms. Ten years ago, Giorgio Ascoli and researchers at Krasnow Institute at Georgetown University launched a digital repository for anyone who created neuron tracings in any species or region of the brain to create a database of sharable, downloadable content. 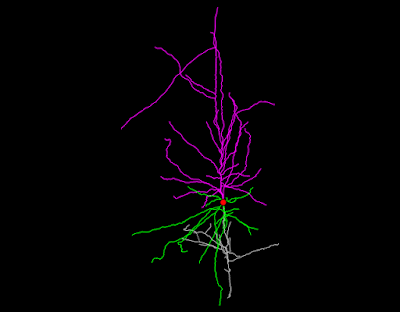 It is one of the only digital neuronal reconstruction databases to date. Giorgio presented some of the challenges and accomplishments of their work recently at the Neuroscience 2018 meeting in San Diego. These methods are still quite labor intensive and expensive. From the nearly 100,000 neuron trees in the database, it has taken researchers over 100,000 years cumulatively and $2.5 million dollars in research funding. 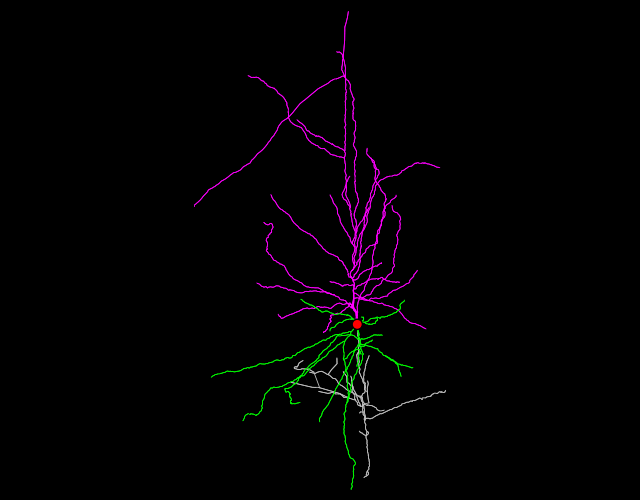 Fig 3: Human, male, neocortical, pyramidal neuron from the NeuroMorpho.org database. NeuroMorpho is currently collaborating with BigNeuron project, from the Allen Institute for Brain Science, and is another potential resource. Along with several other online 3D reconstruction resources such as MatLab (MathWorks), Vaa3D and Imaris (Bitplane), users can upload their tracings to the NeuroMorpho.Org database. This will help the community build a curated neuronal network across species and brain regions in hopes of connecting morphologies to subtle functional consequences.